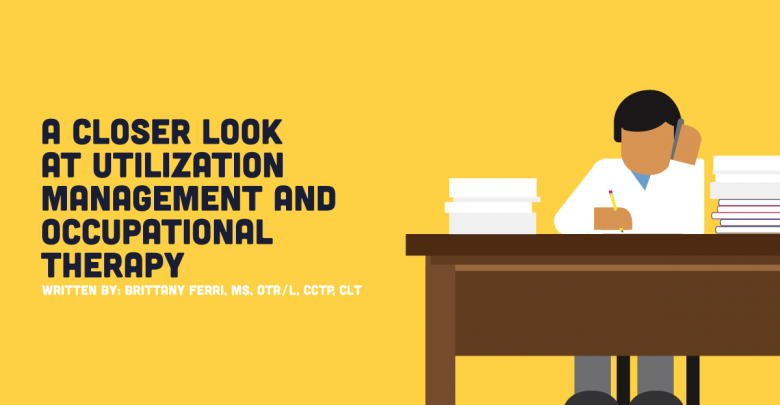 Though an important process to a therapist’s job, utilization management (UM) is not typically a traditional role for an OT to fully assume. Parts of utilization management may be peppered into each therapist’s role, including auditing charts, writing justification letters to insurance companies, monitoring patient progress, and educating others on the need for OT services. But what does someone in a pure utilization management role do? This is common for a clinical therapist, who must complete chart reviews before evaluating any patient. However, this is a large part of a UM clinician’s job, as they must review documentation starting from the first visit of a patient’s plan of care to obtain a full clinical picture. Each role will have its own set of checklists and assessments to complete based on the reviewed clinical documentation. These will be used to determine whether there is appropriate medical necessity for the patient currently receiving services. UM assessments will lead to either full approval of coverage, partial approval, or full denial. This decision will be sent back to the treating therapist to prompt their justification for services, reiterate the patient’s medical needs, or supply more clinical documentation. My role particularly deals with acute and sub-acute cases, which sometimes entails receiving more information from the treating therapist, discharge planner, or case manager. By collaborating with and providing tips to those therapists, UM clinicians can gain a clearer picture of the patient’s medical necessity and how they are progressing in therapy, so the clinician is better informed to make a decision regarding coverage for their care. It is important to note denials do not simply mean a patient can no longer receive services. Rather it is meant to serve as an impetus for a patient moving to a lower level of care, which hopes to place patients in the least restrictive environment possible. Part of collaborating with practicing therapists can involve making recommendations for transitions to a lower level of care. It can be difficult adjusting to the idea of denying coverage for a patient, as a denial implies UM is in opposition of therapy services. Once initial contact is made, therapists become aware the UM is completed by fellow clinicians, and they are receptive to a clinical discussion between peers. Therapists often operate under the assumption that engaging with insurance companies will always be a struggle or result in a reprimand of some sort. However, on this side of the curve, it is clear UM clinicians strive to see a patient’s health insurance appropriately used. This means clinical therapists must place emphasis on the quality of therapy, rather than the quantity. This may be difficult for some therapists to do, but this is important in maintaining ethical practice and high standards of care. UM clinicians are still therapists, so our focus is the same as that of other therapists: ensuring patients receive appropriate care in order to functionally improve and resume their daily activities. For those therapists on the patient side of this equation, the idea of moving to a new treatment plan can be stressful. Check out these tips from reducing occupational therapy patient anxiety from NGOT. With healthcare in its current state, some therapists may feel the need to practice in an area of therapy where they can impact a larger population. By acting as the catalyst for placing patients in the lowest level of care according to their needs and functional levels, UM clinicians are ensuring the best use of medical services and insurance dollars. Often, frustrations with clinical work may be lessened by involvement at a higher level, which can be done by addressing large scale issues. This provides further credibility to occupational therapy services and ensures its inclusion in every medical setting due to its efficacy in a variety of populations. The Big Easy is famous for its tasty food and colorful nightlife. Make sure you know where to go, what to do, and most importantly, where to eat when you visit this April.